Right around the time I stumbled across “My Kid’s Insane Christmas Wishlist, Annotated”, Elena triumphantly handed us her list. Her single-spaced, double-sided 43-item list. I couldn’t resist making my own comments on her Christmas thesis. 1. Netflix. Just an excuse to watch “Pitch Perfect” and the One Direction movie non-stop. 2. Bath & Body Works stuff. When did Bath & Body Works get so expensive? Were they not satisfied with the millions they were making off of innocent parents everywhere on those stupid antibacterial gels with coordinating backpack bungees? $15 for bubble bath? Moving on (smelling like Warm Vanilla Sugar and dusted in glitter). 3. Beats headphones. You’re not an NFL player or a rapper. Talk to me when that changes. 4. iPod 5 OR iPhone 5. It is the law that no child shall have a nicer phone than their mother. I don’t care how many PowerPoint presentations you come up with. And didn’t we just buy you an iPod last Christmas? Are they disposable now? 5. Concert tickets. 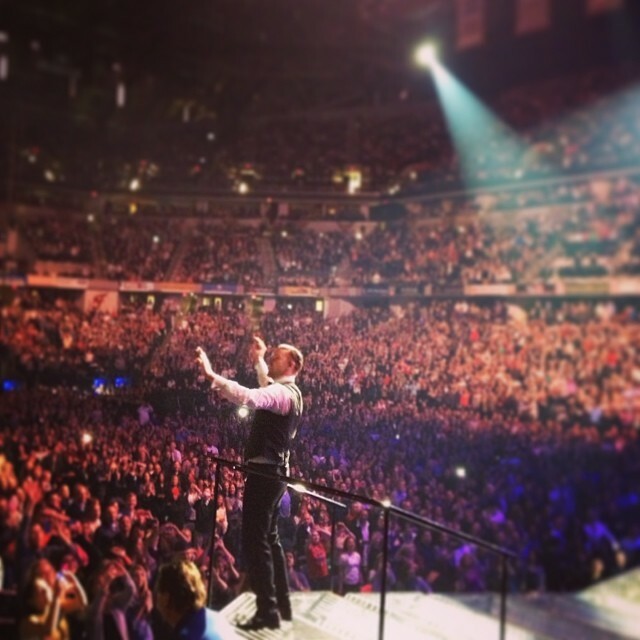 Sorry, we spent all of our concert budget on Justin Timberlake. But we had fun! 6. Gift cards/money. Just make it easy, Mom & Dad. Nothing smaller than a Ben Franklin. And can you take me to the mall? 7. My own supply of cookie dough. Merry Christmas, Elena! We gave you diabetes for Christmas! 8. Cute clothes from Wet Seal, rue21 or Aeropostale. Wet Seal? rue21? Since when does an 11-year-old need clubbing clothes? Um, no. But I will gladly buy you sweatpants and hoodies from Aeropostale all day long. 9. Shirt from Fresh Tops. Oh, darn. The #twerk team crop top is sold out. Sorry, sweetie, Mom tried! 10. Earrings. Finally … something reasonable. 11. Speaker with Bluetooth & remote control. Well now you’re just speaking in a different language. 12. Little Mix, Ed Sheeran, One Direction, and 5 Seconds of Summer merch. Because the the $80 we dropped on concert t-shirts this summer just wasn’t enough. Yeah, no. 13. Taco Bell gift card. This is awesome. $20 and you’ll have a lifetime supply of Baja Blasts and Doritos Locos Tacos. 14. Beanies. I don’t even know what these are, but I’m guessing you don’t want Beanie Babies. 15. Good books/sequels to good books. You want books? With real words and actual pages that don’t need charged? BABY I WILL BUY YOU ALL THE BOOKS. 16. John Green books. See above. Also, everyone should get John Green books for Christmas. 17. Something autographed by any celebrity I like. I think I have autographs from the guys in “Slap Shot.” Does that count? 18. Where We Are (One Direction) tour tickets. I have this on my list, too! Maybe Santa will bring us front row seats! 19. Pre-order Little Mix album. Stop asking for things I can’t wrap. You’re ruining Christmas. 20. Laptop (whatever kind, just not super slow). Well aren’t you so easy to please! 21. Kitten. Only if I can wrap it in a box like Aunt Bethany. 23. Conair Medium Spiral Curlers (pink with blue tip!) God forbid I get the blue ones with the pink tips! Christmas is ruined! 24. Longboard. Aww … then I can ride your penny board and we can skate to Taco Bell together and use that gift card Santa brought you! 25. NICE CAMERA. A girl after my own heart. But do they make any that only take selfies? 26. PLEASE ↑. Since you asked so nicely (and in all caps). Wait, are you asking nicely or are you yelling at me? I don’t think I like your tone, young lady. 27. Galaxy/stars poster for inside my little closet cave on the ceiling. (Yes, she really does have a little closet cave. Sometimes I hide in there and eat chocolate so the kids can’t find me). Here’s an idea: GO OUTSIDE AND LOOK AT THE REAL LIVE STARS. 28. Vans shoes. Aww … skater shoes for my Taco Bell-loving hipster-in-training. 29. Plain-colored Converse. I hope you don’t mind – I found a great deal on some Yo Gabba Gabba ones instead. That’s cool, right? 30. Tall Uggs. Tom Brady wears Uggs, therefore there will be NO purchasing of Uggs on my dime. 31. Food. Because, you know, we don’t actually feed our children. 32. Louis & Harry (of One Direction) stand-up things. I realize we have a bigger house now, but an entire collection of life-size boy band cut-outs is pushing it. 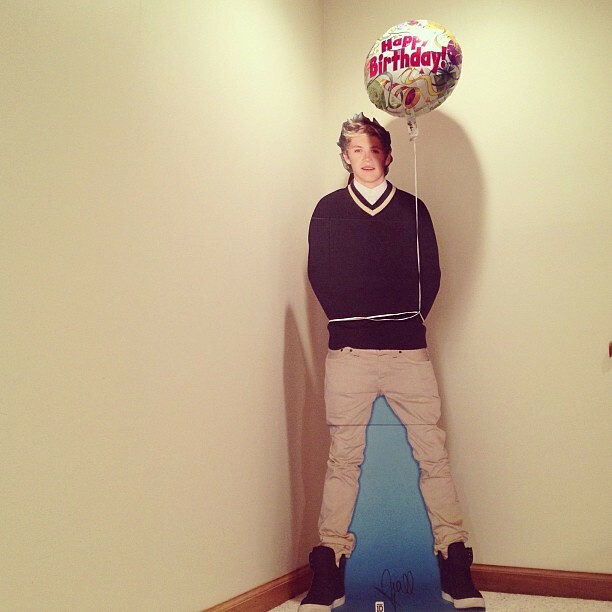 Also, Niall still freaks me out when I walk into your room. 33. Christmas lights. You get on a ladder and string them up outside yourself and we may just have a deal. 34. To get braces. Now our dirty secret is out … we don’t feed our children or take them to the dentist. But I’m pretty psyched about the year you finally do get braces and I don’t have to buy you anything else for Christmas! 35. Stuff from Lush. I hear ya, kid. Those bath bombs are da bomb! 36. Keyboard. No, no, sweetie … what you really want is a keytar! 37. New light for my room. NO. We said use your kerosene lamp judiciously. Now you’re all out of fuel and you want us to do something about it? NO LIGHT FOR YOU. 38. 3Doodler. This sounds dirty. I’m scared to Google it, so no. 39. To get my nails done at a salon. So that one day you can have a fight with your husband about how you’re not living the lifestyle to which you’ve become accustomed! Well, okay, but only if Santa brings mommy a pedicure to go with it. 40. Kindle. The poor man’s laptop. I see what you did there. Nicely played, kid. 41. Mini iPad/Windows 8 thing/some kind of tablet. I got you this instead. You said “some” kind of tablet, right? 42. Let me watch Big Bang Theory. Only if you address all questions regarding sexual innuendo that you don’t get to your father. 43. XBOX ONE PLEASE. Thank you, Xbox for rendering our Wii totally uncool and making us look like assholes this Christmas if we don’t buy one. Especially since it’s the only thing Eli asked Santa for except for candy shaped like LEGO blocks. I’m just going to wrap the pet rock in an empty Xbox package and watch my children cry. And that concludes Elena’s 2013 Christmas list. Stay tuned for her birthday list this summer, where she only asks for two things: whatever Apple just came out with and a new mother. Allow Me to (Power) Point Something Out to You, Dear Parents. You’re commentary on this list has my laughing out loud! Too funny! Casey and I read these outloud to each other last night and I was crying laughing. 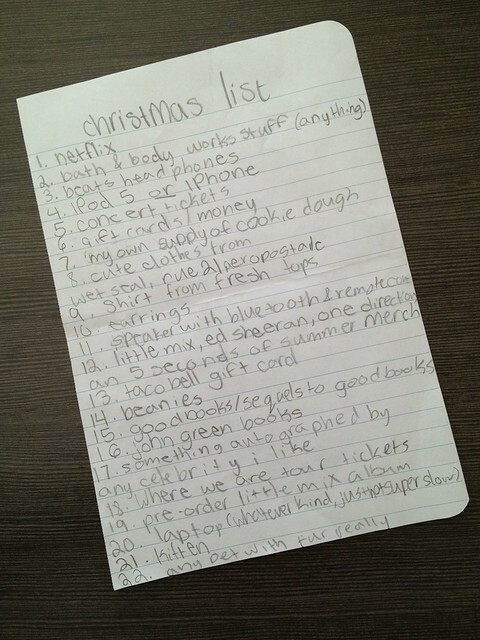 Also, just crying because half of her list is my list? Says the 31 year old with floor seats to see 1D in Chicago and let’s not even talk about how yes, yes I would like a cardboard cut out of Harry and Louis. And no, YOU clapped like a seal when you saw the full size Niall. Cardboard Niall can come over for a visit anytime you want. And yes, this *nearly* 40-year-old woman is jealous of your 1D floor seats.